Left to Right: AWC 2006 National Breeder-Judge Mr. Bo Bengtson (Bohem); Moxi's US Handler Mandy Clevenger; Owner Angie Diehl of Nysa Hill; and AWC Vice President and National Show Chair Cindy Scott. AWC National Photos (c) Lorie Crain; visit ImagesByLorie.com. Moxi is Unretouched. "She is one of the best whippets I have ever seen anywhere, fully worthy of everything she has won and then some," said Bengtson of Bohem Whippets, and author of The Whippet. "She has a beautifully balanced outline with long, sweeping curves, an easy flowing, powerful stride, and was in excellent condition. "She... has a lovely head, a long gorgeous neck, the best front assembly possible with a clean, sloping shoulder and a long upper arm, beautiful bone and feet, an excellent topline and strong hindquarters," Bengtson said. 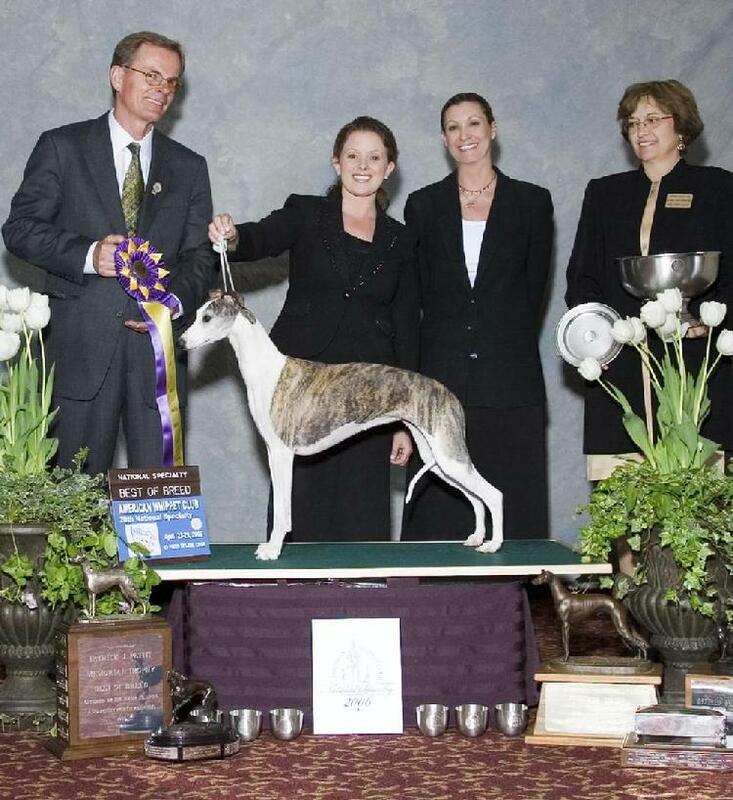 Moxi bred by Dr. Dennis Sumara/Brushwood; Linda Stewart/Endeavor; and Breeder-Handler Raymond Yurick, who showed Moxi to her her first AWC National Best in Specialty Show in 2004 and BOS in 2005, to #1 Whippet and Top Five Hound in Canada and to her first all-breed BIS in America. Owned by Angie Diehl of Nysa Hill. Co-Owned by Dr. Dennis Sumara/Brushwood and Linda Stewart/Endeavor.